The design of the Staunton chess pieces has been hugely influential since they came onto the market in the mid 1800s. One of the most important factors is the distinction of each piece, in that no single piece within the set looks remotely like another. Despite this they share enough design similarities to make it obvious that they come from the same set. Another great thing about the Staunton design was its practicality. 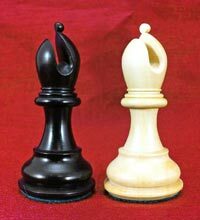 They were designed with chess playing in mind, they were functional yet amazingly elegant. They tick all the right boxes when it comes to earning themselves a place in history books as an iconic and classic design. The king is of course the largest and most substantial of the set. The sets were sold in a variety of sizes and the height of the king gets used as the measurement by which the whole set is judged and marketed. 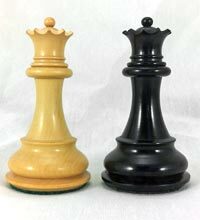 So when someone refers to a set of four inch Staunton chess pieces they are always referring to the height of the King. 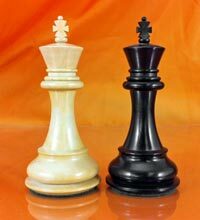 Compared to other chess piece designs the king has a very wide base in relation to its height. 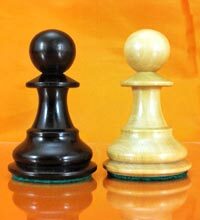 You will notice a beveled shank (the main trunk length of the chess piece). This bevelling not only makes the king look very elegant but helps with balance and a perception of weight. It’s important that the chessmen felt right in the hand, and felt good being picked up by fingers and moved around the board. Adorning the top of the king is its finial. This was always a separate piece of wood that slots into a hole at the top of the king. This has typically been a cross design and allows the king to be instantly recognisable from the queen. The base of the king, like all the pieces, features a tapered moulding that gives the impression that the chess piece is floating a couple of millimetres above the surface of the board. 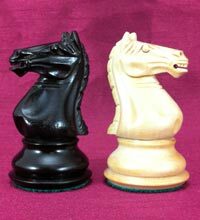 The bases on Staunton chess pieces were always covered in felt, and in some cases leather. The queen shares the same sweeping shank as the King but features a much more feminine crown. She shares the same base design as the king but of course everything is smaller. The queen features a little ball at the top and individually cut spurs on her crown. The queen is elegant yet simple in her design. She is turned on a lathe with the only piece of hand carving being her crown. The bishop features a much shorter version of the sweeping shank and an identical yet smaller base to the king and queen. The top third of the bishop forms its hat which has the classic slotted design. This was based loosely on the headgear Christian bishops wore. Referred to as a Mitre, the hats featured the diagonal slot in them much like the slot in the chess piece. Earlier pre Staunton designs often had very symmetrical mitres, much more like the actual hats themselves. The artistic license used on the Staunton bishop was certainly well deserved. While it departed from the original hat deign it looked elegant and was very functional. The knights are without doubt the most intricate and interesting piece of the set. The Staunton knight is made in two parts, a turned base that uses the same profile as the other pieces and a hand carved horse head that sits on top. The horses head was very much an interpretation of a real horse, indeed variations on the design have featured highly realistic knights that are much closer to a real horse in looks and profile. The Staunton knight is elegant and a smart and beautiful representation of a horse. It has become something of an icon. Among the Staunton sets there were different versions of the knights, some more detailed and elegant than others. The original sets were produced for many years and over that time the knights and their carvers changed and evolved. The rook is both elegant and simplicity combined, the result is a beautifully proportioned chess piece that ticks all the right boxes. The rook is unmistakably a castle turret, indeed it is often referred to as ‘the castle’. There is a straight edged tapered shank with protruding turrets at the top. In practical terms this makes the piece very easy to pick up and put down and its overall shape also makes it stable. The pawn in the Staunton set is the perfect combination of elegance and practicality. The ball on the top makes it tactile and very easy to pick up and put down. The wide weighted base makes it stable with no possibility of it toppling over. In fact if you give the board a good jolt its unlikely you will see any of the chessmen fall over. They will lose their place for certain, but fall over they will not. The pawns are the easiest of the pieces to make. They are entirely turned on a lathe with no additional carving required. Part of the genius of the design was its suitability for mass production. It is worth noting that the term "Staunton Chess Set" refers only to the chess pieces. As far as we are aware there was no specific type of chess board endorsed by Howard Staunton at the time he endorsed the pieces. 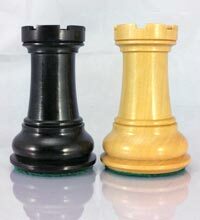 It has become very common to see Staunton chessmen being used with a very basic, and very traditional mahogany and maple chess board. Part of the reason for this is that the contrast in colour between the black ebony and the medium brown of the board works very well. Because of this contrast you can see exactly where all of your dark pieces are without needing to strain your eyes to pick them out against a black chess board. 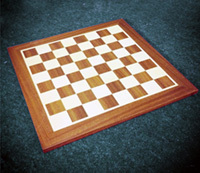 So while there has never been such thing as a Staunton chess board we would always recommend using a basic medium brown and maple board such as the one shown in the picture.